OSMOUK Post Fix is a strong, easy-to-use, and fast-setting solution that allows users to fix a post in a matter of minutes. 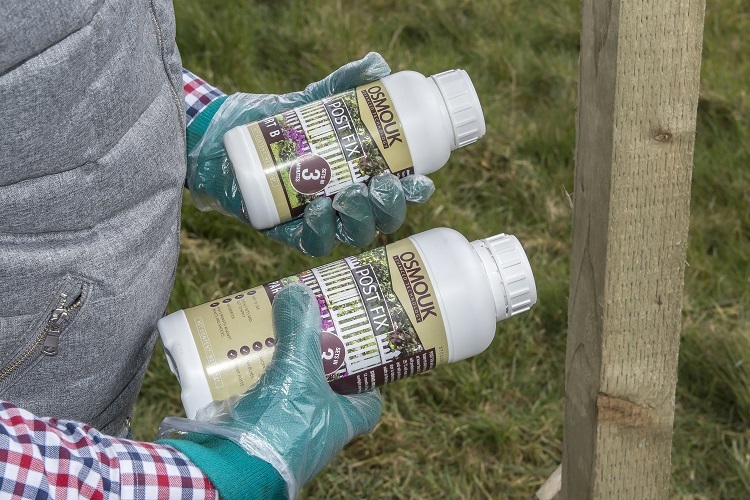 Whether you are installing garden posts or sports poles, OSMOUK Post Fix is the ideal product for those who are looking for a cost effective, lightweight alternative to using concrete. OSMOUK Post Fix is a DIY product for use on small projects that require a quick and easy solution. With no complicated installation process and no need for any tools or fixings, everyone can use OSMOUK Post Fix. Applications include fences, garden lights, post boxes, signs, washing lines, and bird baths, as well as sports posts, such as basketball hoops and football, tennis, and volleyball nets. OSMOUK Post Fix has been specifically designed for use with wood, vinyl, PVC, steel, concrete, and metal posts. Filling the void between post and hole, this two-part component ensures the installed post is secure, providing high strength against impacts and shocks. The solution is waterproof, which helps to protect the post against rotting. Users can install posts using OSMOUK Post Fix all year round. The installation process is extremely quick and can be done within minutes. To begin, dig a hole that is twice the dimension of the width of the post, and stand the post in the hole. To prepare the mixture, simply mix Part A and Part B and shake the bottle for 20 seconds. Immediately after it has been mixed together, pour the solution into the hole, with the post firmly in place. The solution will then expand in the hole, securing the post in the desired position. Once secured, you can cut away any excess solution, and then cover with sand. OSMOUK Post Fix has a shelf life of 12 months, if stored in its original package and away from direct sunlight and moisture. Where can the product be purchased? It will show you a number of stores that supply OSMOUK Post Fix, the price varies from £8.90- £8.99 depending on the store you purchase from. It will show you a number of stores that supply OSMOUK Post Fix. After shaking for 20 seconds maximum, pour the mixture in the hole straight away to avoid expansion starting in the bottle. Answering your question regarding the setting time, Products from bottles kept at lower than 22° will take longer to react, expand and set, and will also produce less volume. Product from bottles kept at higher than 25° will react, expand and set faster, lowering the working time and producing a higher volume. I intend to erect 8 “x2”posts in a line abou 1200 mm apart. will I need a separate bottle for each post? Hi Anthony, Yes thats correct 1 x Post Fix is required per fixing. OSMOUK Post Fix is a strong, easy-to-use, and fast-setting solution that allows users to fix a post in a matter of minutes.